4℃ AQUA PROGRAM 2014 Completed! The jewelry brand 4℃, deployed by YONDOSHI HOLDINGS INC., was born with a concept that the brand wants to be like water which does not change essence even though change the appearance. 4℃ AQUA PROGRAM aims to bring beauty and inspire the women of developing countries who face serious water and hygiene problems. 4℃ AQUA PROGRAM established in 2008 is a joint project with YONDOSHI HOLDINGS INC. and Japan Water Forum. This year, JWF carried out the project in Sri Lanka. The details are described below. 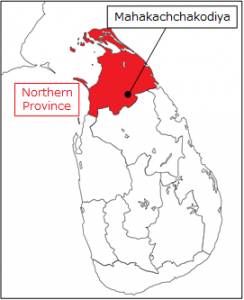 Water resources are limited in the Northern provinces of Sri Lanka. Ground water is the only source of water in this area and has also been over exploited or contaminated. As a result during the dry season people experience water scarcity, the dug wells and tube wells dry up and people have to travel a long distance to fetch water. 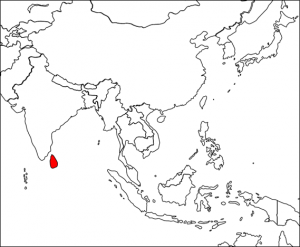 In addition to that, a new form of kidney disease has started spreading in the Dry Zone of Sri Lanka. The occurrence is mainly amongst males of age group 30–60 years engage in agriculture. Almost 80% of these patients eventually die from kidney failure within the first two years after diagnosis. High prevalence of Chronic Kidney Disease (CKD) patients has become an environmental health issue of national concern in Sri Lanka. 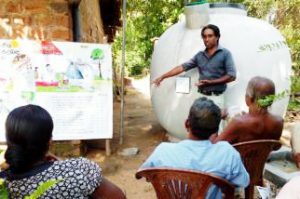 ・Rainwater harvesting tanks (8,000 liters size in each) were installed in 14 households. ・Operation and maintenance training was conducted to each household. 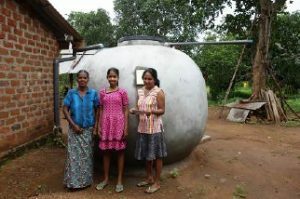 ・Each household can secure and use 10 liters of rainwater per a person for the purposes of living including drinking during dry season. 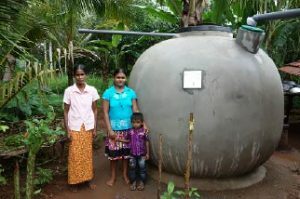 ・Trained households are able to maintain constructed rainwater harvesting tank. ・Women are released from daily burdens of fetching water. ・The cost for purchasing water can be reduced. ・Instead of using well-water, using rainwater will prevent beneficiaries from onset and progress of kidney diseases.